More than 60,000 people gathered in Central Park in New York, US, for the Third Annual Global Citizen Festival, to demonstrate global unity and support for ending extreme poverty by 2030. The festival featured musicians, actors and world leaders, and was broadcast around the world. It aimed to educate participants and viewers about sustainability issues including sanitation, education, and vaccine provision, while securing new commitments and partnerships for action. 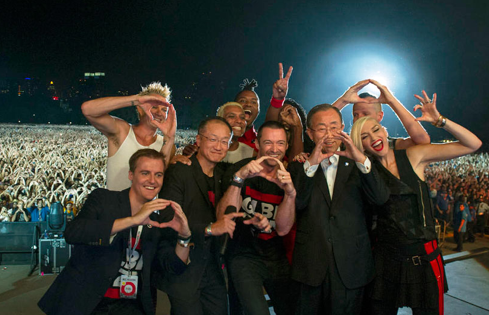 27 September 2014: More than 60,000 people gathered in Central Park in New York, US, for the Third Annual Global Citizen Festival, to demonstrate global unity and support for ending extreme poverty by 2030. The festival featured musicians, actors and world leaders, and was broadcast around the world. It aimed to educate participants and viewers about sustainability issues including sanitation, education and vaccine provision, while securing new commitments and partnerships for action. The Festival, which is organized by the Global Poverty Project, requires citizens to commit to online actions and informative tasks in the lead-up to the concert in order to win tickets. Now in its third year, the Festival also brings together leaders from government, philanthropy, the private sector, and the media to commit new initiatives and donations for development issues. Speakers included Narendra Modi, Prime Minister of India, Erna Solberg, Prime Minister of Norway, and a video message from Barack Obama, US President, with musical performances by Jay-Z, Beyonce, No Doubt, Carrie Underwood and others.